Ibrox Noise: "Why won't Dave King invest?" "Why won't Dave King invest?" 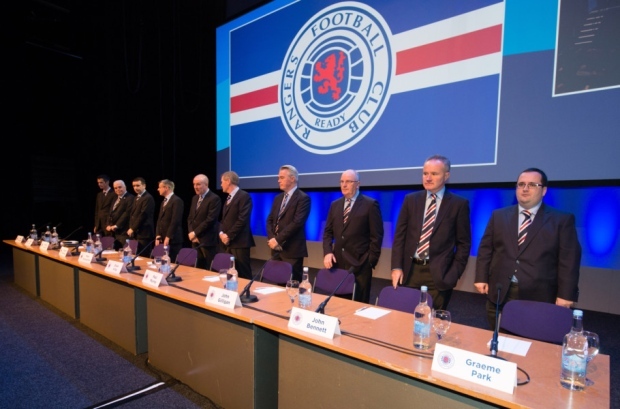 Dave King and investment has been a recurring topic among Rangers supporters over the past year or so, ever since the South African-based businessman and his colleagues John Gilligan & Paul Murray usurped the previous board at last year’s EGM election. The general objection from many fans is/was the apparent lack of it, despite promises being made to the contrary. Admittedly lavish promises of £50M investment had been reported prior to King’s victory, and some fans felt this had not been delivered. The past two financial reports have both confirmed reduction in losses – November’s losses (covering up till June last year) were still massive (£7.5M) but that was over half a million down. And with Rangers confirming a colossal reduction again in recent days to just over a half million in total, the evidence is growing that while the investment is not obvious, it is there. King famously claimed when he took over that there would be around £20M investment, of which he would support £10M, leaving the other half to his colleagues. The numbers released recently confirm that nearly £10M has gone in up to December, the kind of critical working capital needed to keep the club ticking. This has covered many things such as repairs, upgrades, legal costs; the minutiae of various overheads a company the size of Rangers has. Plus, of course, it would be utterly churlish to forget that new signing Michael O’Halloran is the single-most expensive asset Rangers have purchased for many a year – only Hearts’ David Templeton was of a likewise significant amount but that exact figure was undisclosed. Rangers’ outlay of an initial £350,000 on O’Halloran rising on clauses is a superb example of the new solidity of the Club’s fiduciary state and one of the major examples of what Rangers’ new investment has achieved. In short, the money is going in – it just is not being done in the shiny headline-grabbing way fans perhaps expected. It is also mostly being done as that aforementioned working capital because until income is in line with the overheads, Rangers are still making a loss and that will be a black hole for serious investment until parity is achieved then supplanted into the black. Meanwhile revenue itself (overall income generated) has actually gone up a small chunk by almost £2M – still not enough to stem the losses entirely but it is on the right path. It is clear the board has done a great job of attracting investment, most of which has been delivered by King and the Three Bears shareholders; sure, it is not yet ‘outside’ investment, but that usually only takes place when a company is in the black and the investment is delivered to profit the investor in time. Such activity will begin in earnest with Rangers’ inevitable promotion back to the Premiership which should finally see the Club profiting regularly. And before any paranoid comments claim this site is run by Level 5 (the same comments previously accusing it of being Sandy Easdale’s stooge & mouthpiece) I can assure you this site is accountable to no one. Like you, I and the other writers are simply fans of the club we love, and it is a breathe of fresh air to see things moving so well on and off the pitch in tandem. We don't need to spend any money yet. We have almost achieved our aim of getting back to the premiership. The time to spend money is next season and only when we have to.Celtic are a heap of shite at the moment so let us see how we get on before we squander money. Wasting money is how we ended up in the state we are in. You are very good at telling Dave King to spend his money but not where. Slowly, slowly catchee monkey. Down to earth language Roly and a sensible comment as well. Celtic are the best of a bad lot in the premiership and they are, indeed," a heap of shite". The squad Rangers have at present will, shortly, reveal just how bad Celtic are. It is Celtic who will be playing catch up in the transfer market. MW will make a few astute signings for minimal fees. his judgement will see Rangers in good shape to lift the title next season. well ahead of all previous expectations. I completely agree with your excellent view. I do think that Rangers will need to outlay more during the close season due to the fact that we will be back in the top flight. Celtic, as has been pointed out are not that great just now, the key is the words 'just now'. They are not stupid and have not spent much money, however with Rangers being back in the top flight they know they will need to invest more to keep Rangers at bay. Celtic will still win the league this year and have money in reserve for next season. If anyone offered us this sort of stability four years ago we would have bitten their hand off. Rangers on and off the park are in a fantastic position, promotion to the big league brings more investment from outsiders. We will always be in debt to Dave King for the fantastic job that he is doing. Well said the noise. We must be prudent with our money these days. No amount of heavy handed investment would have seen us better off than we are right now. That should be food for thought to bears who are stuck in the 1990s. The simple fact is only 16 or so clubs in Europe spend big to win these days.. And I should point out that celtic aren't one of them. We should enjoy the current situation - savour a moment that will be looked at in years to come the same way we look at the souness'/David holmes formative years. The management and backroom staff is the most important investment Rangers can make.What an eye for a player they have and their commitment is total. Harmony can take Rangers to where they aspire to be and MW will surely get the financing required to achieve the biggest aims of the club.I'd really like us to win the League,Scottish cup and Petro cup. That would be a great platform to attract the few more players to our club, and see MW buy a great home in Glasgow with a 25 year mortgage.The man is total class, top to toe. Well put Ibrox noise and I agree Alex...Rangers are being very business like in everything they do... right down to things like diet even...I believe this board are getting it right...no one is perfect but warbs is as close as we could get...its absolutely amazing how far our great club has progressed in such a short time...Don't forget Mr King will likely have a few more battles with the "Fat Bas**rd* at Sports direct which may cost a bit of money...Keep the faith bros! We will prevail! "RANGERS ARE SIMPLY THE BEST"
They can't invest until there is a share issue. The point of investing is getting shares in the company you invest. They can only give interest free loans until a share issue is agreed. The investement will come once the club is listed on the stock exchange and share become available... Simple business. I would agree totally with the views expressed and would add that until the various legal issues have been resolved or at least clarified i.e. the prosecutions and contract issues it is unlikely a share issue will be forthcoming. This is a sensible precaution to maximise the income from any issue. The club is in good hands and going in the right direction both on and off the field. same old, same old, who knows if king will invest or not the objective was to get promotion'we are nearly there so why bring up that old chestnut about giving the manager millions'Warbs has already stated there is money available if the right player in his evaluation is available. I think King going about things the right way with all the offield issues to contend with,give him a break.